Super Hot – EF 100-400mm f/4.5-5.6L IS USM (Old Version) for $999 at Adorama ! Canon USA authorized dealer Adorama has a great deal on old version of Canon EF 100-400mm f/4.5-5.6L IS USM lens. This is currently lowest price for this lens. 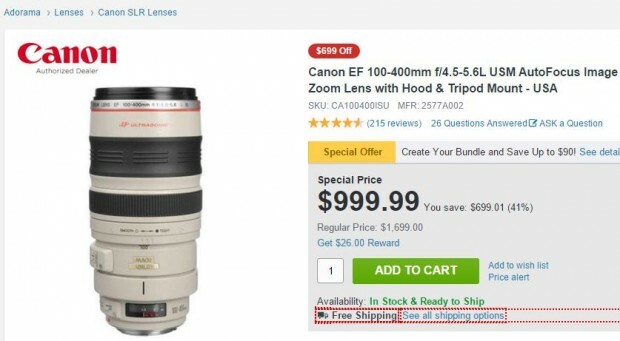 Regular price for EF 100-400mm f/4.5-5.6L IS USM lens is $1,299 at most US stores. The new version of EF 100-400mm II is $2,199. ← Hot: 10% Rewards on Canon 1D X, 5Ds/R, 5D Mark III, 6D, 7D Mark II at B&H Photo !